Hands down one of the coolest dining and travel experiences of my life! We were picked up from Hanoi’s airport by a lovely young lady and her driver, who took us to our hotel. On the drive over, we talked the whole way, asking each other question after question. Her English was fantastic, and we found out she had a good friend in Sydney, which gave her a good opportunity to practice. We asked her for her recommendations on the things she thought we should see and her favourite places to eat – she proceeded to write out a double-sided notebook page for us! 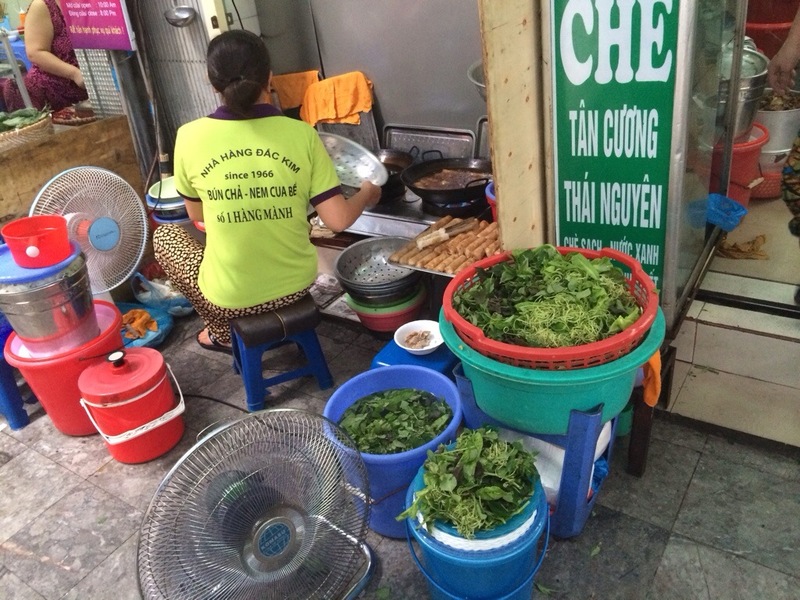 We told her our favourite Vietnamese dish was bun cha – a huge smile spread across her face and she started to furiously scribble onto the page again, telling us this was her favourite food too, and she’d give us the address of her pick for the best place to get it in the city. Once she dropped us off at the hotel and we got a few photos taken together and exchanged email addresses, we dumped our suitcases in our room and prepared to head back out and find us some bun cha. It took a little while, but eventually we found the street name. The ridiculous amount of people massed out the front indicated we were in the right place. Once it was clear that we were interested, we were quickly ushered into the establishment without a word from the lady. It looked like a little shop front that was already full and couldn’t possibly accommodate us; we were then ushered up two flights of stairs and to the end of a communal table. Without a word being exchanged, we pointed to a nearby water bottle and held up two fingers (we were aiming for 2 bottles of water, and we had them within 60 seconds), then settled down to survey our surroundings. Shoulder to shoulder, sardine-tin dining with miniature street side plastic stools and a crazy, market-style atmosphere. It was perfect. We’d no sooner taken in the full 360 degree view than looked down at the pile of food that had materialised in front of us. 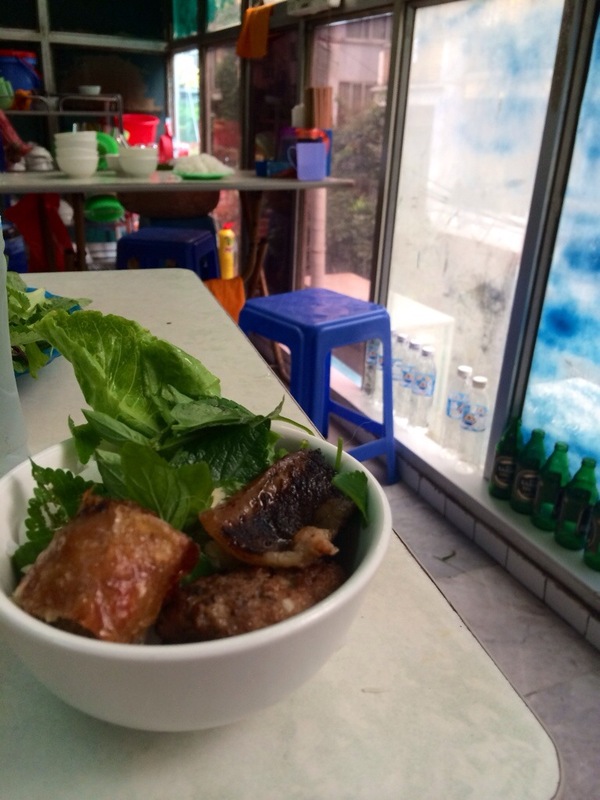 Much like the fabulous experience we had at Bale Well in Hoi An, it appeared that AUD$5.00 got us a bottle of water each as well as all we could eat bun cha. 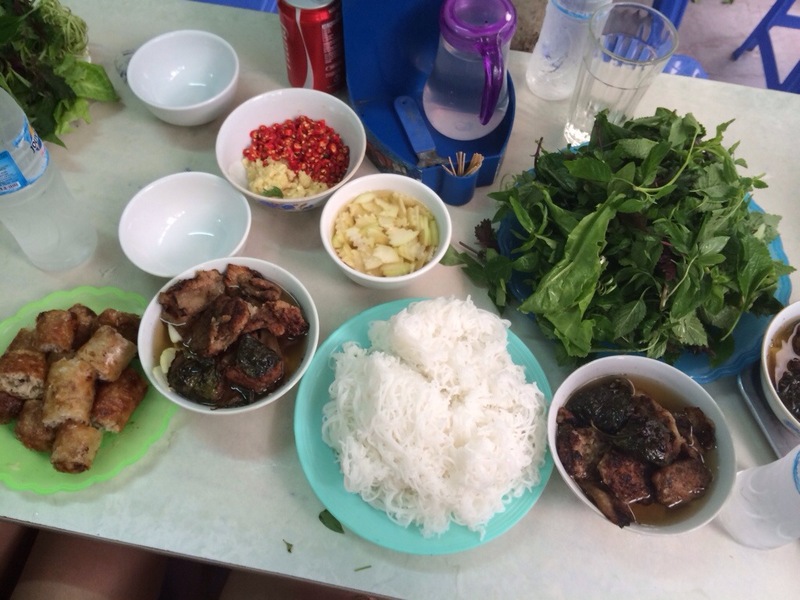 Pickled vegetables, a veritable mountain of noodles, half a garden worth of fresh herbs, fresh spring rolls and god knows what kind of meat wrapped in leaves and swimming in undoubtedly the best broth either of us had ever had. So there we sat, looking at each other over the small plastic trestle table, simultaneously bursting out into laughter. We could not believe it! From what started as a “I wish we could just go to Vietnam and eat our way around the country!” We had actually made it a reality! 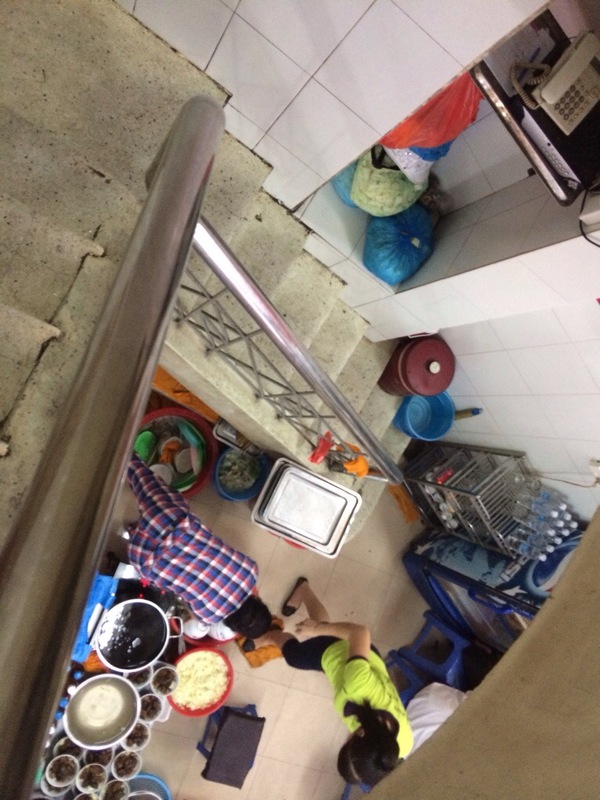 We were sitting in a little nondescript street side shanty, three stories above Hanoi, eating the most spectacularly delicious spread of food! If you’re in Hanoi, please take down this address and ask your hotel or hostel front desk for directions; it’s one hell of an experience!